Kiely, took the picture. Does it LOOK MAD? Why did you go so close? We had another rescue, this morning, but the guys on the firetruck hate snakes , so they stayed away. The firemen were not MY HUSBAND or SON. 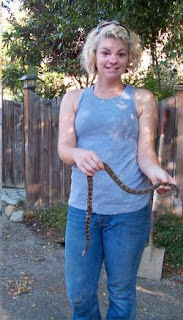 Nice Kiely, very mad snake, very aggressive, and you ARE brave. Please make your mother feel better and let the firemen or the rescue snake guy get the snakes! 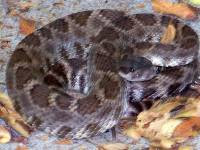 There is no snake anti-venom in town and this snake is so dangerous. Just looking at it makes my heart pound. It's the season. Actually, to be truthful, they are always here and a threat. We've almost now had perpetual summers these past few years. And...I love it that there are no ground squirrels (mice with long tails) and there are fewer rats and mice. But, snakes? Where are the King Snakes when you need them? lol In the Jenkin's house being a pet! Kiely quit being so brave, you almost got it. good job kiely! she cowgirled up on this one.